TV. Both bedrooms have ceiling fans. Den has pullout sleeper sofa with desk and wifi. Queen air mattress stored in closet for guests or kids. Dining room has table for 6. Kitchen is fully equipped with granite counter tops, dinette, dishwasher all appliances and utensils. Utility room has sink with brand new washer and dryer. 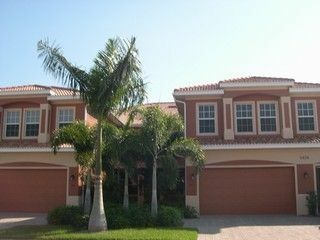 Large lanai with patio furniture and grill with beautiful view of lake. House is comfortable, spacious and very well maintained. Master has large bathroom with shower and jacuzzi. This is a beautiful, clean Coach Home in a secure gated community with a lovely lakeside view only 5 minutes drive from the Lely Players Club and golf courses. The tennis facilties are amazing with very welcoming local players of all standards. Downtown Naples with its beautiful beach is only a 15 minute drive away. The owner was very friendly and quick to respond to any enquiry. We would be delighted to return. This was our second season renting this condo/coach home and we would not hesitate to recommend. The home is spotless, with a fully equipped kitchen, spacious master bedroom / bath and a second bedroom/ bath that gives privacy for guests. The unit has a large den with desk and seating, plenty of room if additional sleeping space is needed. The Lanai has a beautiful view of the lake/fountain. Legacy is a quiet, secure and friendly neighborhood. The owner Ray was always in reach if we needed to speak with him, but rarely did we need to. Our favorite amenity was access to the nearby Players Club which we loved and used often. We found Lely/Legacy to be a perfect EastNaples location, only a short ride to Marco Island or Downtown Naples/ Gulf Beaches. The home was beautiful. Nicely furnished with lots of room. The area is very quiet with little to no traffic. The players club is unreal. You feel like you are on secluded island when you are there. Great fitness centre, spa and pools. Home is only a 5 minute drive to downtown Naples and the Gulf of Mexico. Great place for anyone to stay. Thanks for an amazing time. HOME WAS SPECTACULAR ALL BRAND NEW CONSTRUCTION OVERLOOKKS BEAUTIFUL LAKE FURNISHED NICE AND ROOMY .THE PLAYERS CLUB IS OUT OF THIS WORLD AND THE GOLF COURSES ARE GREAT THIS WAS MOST PLEASURABLE STAY.